Nearly a century ago, it was a bustling hamlet with a railroad station, businesses, grain silos and rows of houses lined up like soldiers along the rail line. Today, it’s a soybean field with no visible evidence of its history to passing motorists. 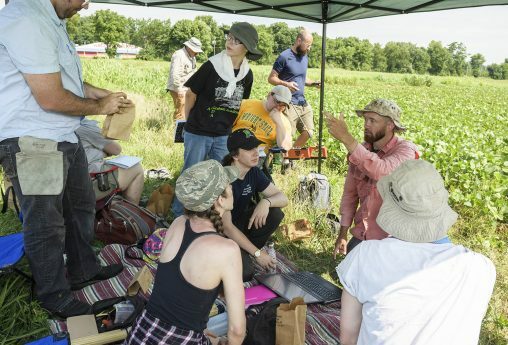 But Wright State University students in the College of Liberal Arts’ Field School in Archaeology have collected evidence of the original Osborn, a town that was relocated to protect it from flooding following the Great Dayton Flood of 1913. Osborn and the Miami Conservancy District were an early test case for what would become the Tennessee Valley Authority in the 1930s and ’40s. The development of dams under the TVA displaced more than 15,000 families. Osborn was named after E.F. Osborn, superintendent of the railroad line that was built through the town. Following the Great Dayton Flood of 1913, Huffman Dam was built, putting Osborn in a floodplain. So in 1921 the entire town was relocated two miles away, next to Fairfield. In 1950 the two communities merged as Fairborn. Many houses and businesses in Osborn weren’t moved in the 1921 relocation and were demolished. Today the site — a field that sits in the shadow of Wright-Patterson Air Force Base — is referred to by historians as Old Osborn. The site is owned by the Air Force but is leased to farmers, who most recently have used it to grow soybeans. 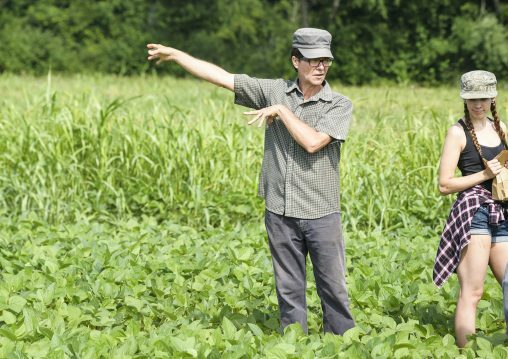 Greene and his students created a grid of 10-meter squares in the soybean field as part of a controlled surface collection. Metal wires crowned with orange tags poked up through the soil, marking off the plots. A tape measure rode the tops of the soybean plants to help mark the grid. Students in sunhats trolled the field, collecting artifacts that popped to the surface from the farmers’ plows. The artifacts were placed small brown paper bags that bore location identification numbers. Artifacts collected from Old Osborn. Buffington kept a detailed journal of what was found. After she graduates, she is thinking of going into cultural resource management, which can involve investigating land to ensure that historic or prehistoric sites aren’t destroyed. Greene said the artifacts create a window into what Osborn residents had in their homes. And using old maps, the students can pinpoint the artifacts to the individual homes. “When we collect artifacts from a square, we know what house was there and what family was there so we can compare the things we find to the people who lived here,” said Greene. Doll, who wants to work for the National Park Service one day, discovered a tiny piece of ceramic with a handle that could have come from a children’s tea set. When the students found a colored shard of glass and took it back to the lab, they discovered it came from a bottle of Chamberlain’s Cough Remedy, which was sold between 1908 and 1918 and advertised as a safe cough medicine for children. In addition to collecting artifacts, the students were able to observe workers from the National Park Service who were using ground-penetrating radar to identify underground foundations and objects and to quickly identify the location of the town for possible future excavation. 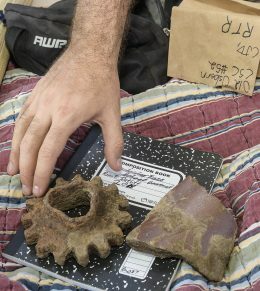 Lance Greene, assistant professor of anthropology, started the Field School in Archaeology to teach students how to excavate, identify artifacts and record information. After collecting the artifacts, the students took them back to the lab at Wright State, where the artifacts were washed, processed, analyzed and used to create a database. The artifacts will be temporarily housed at Wright State and then likely turned over to the Air Force.